Casey Stoner returned to the track today on the Ducati Desmosedici GP of the Ducati Team at the Sepang International Circuit in Malaysia. It was a welcome return for the Australian rider, two-time MotoGP World Champion, who had not ridden a Ducati since the Valencia round in 2010. 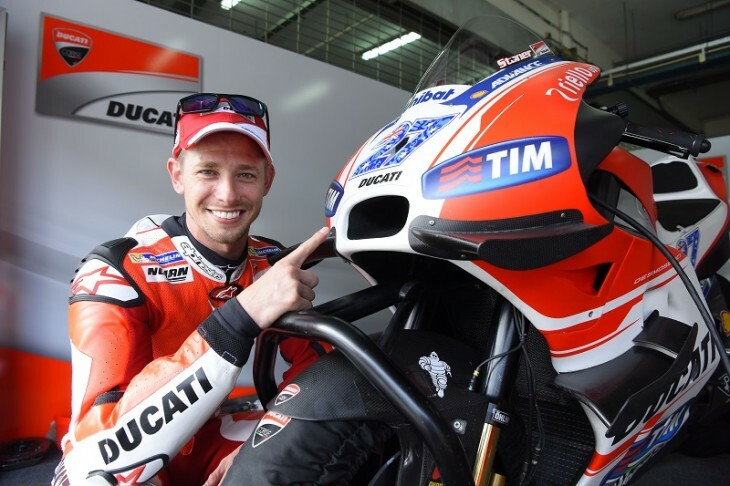 Stoner completed a total of 54 laps on the 2015 model Desmosedici GP machine, setting a best time of 2m02.1s on his final run late in the afternoon. Michele Pirro also went out on track this morning, but just for a few laps. The Italian rider tested a 2016-spec Desmosedici GP bike fully equipped with instruments and sensors and also carried out a fuel consumption test. Both Ducati test-riders will be back on track tomorrow for the last day of private testing, before the official IRTA test that runs thru February 1-3.